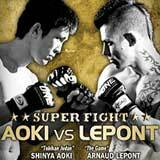 Review: 2012-10-06, great submission between Shinya Aoki and Arnaud Lepont: three stars. Shinya Aoki ranked as the No.22 lightweight in the world, entered the fight with a record of 30-6-0 while Arnaud Lepont had a record of 9-1-0. Aoki vs Lepont is the main event of ONE FC 6 ‘Rise of Kings’. Watch the video!